Hello on this cool winter day. We are suppose to get a lot of snow in the next 24 hours, yuck! That means shoveling, well at least it's not cold outside. I don't mind the snow but I sure dislike when it's cold and blowing. You know that wind that chills you to the bone. I think the temperature is suppose to be seasonal. Which is okay. A good day to craft and stay indoors. 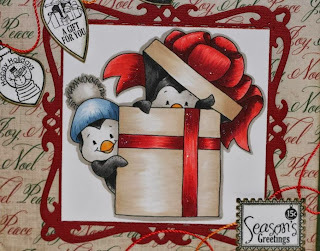 This is a card I made using a super cute image from Whimsy Stamps called Penguins are present from designer Crissy Armstrong. This was a great image to work with, a wonderful Christmas card for someone special. Christmas is just around the corner again. wow how time flies hey. I hope you get some cards done and that this little cutie will inspire you to do so. A closer look at the colored image, also in the corners of the photo you can see another great Whimsy product, one is the mini Postage stamp and it was cut out with the matching die. 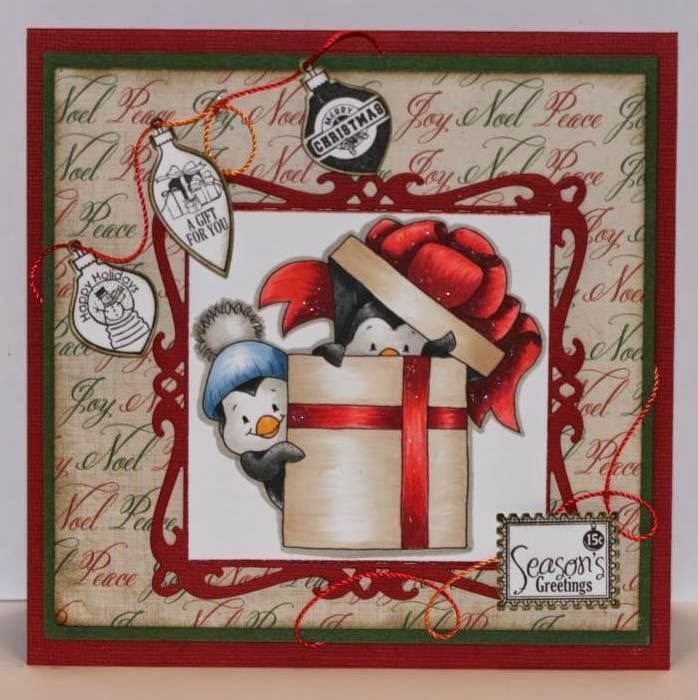 On the top left corner you can see the seasonal ornament stamp set and that was cut out with the matching die. Thank you tons for stopping by again. Stay warm and have a crafty day! What a great card! The background paper is sooo perfect for this image and I also really like the die cut. Awesome great job, love the image, and the colors are so rich...wahooo!! !